My trip to beautiful Flagstaff, Arizona has come to a close. Let me tell you, the weather was absolutely beautiful! As I sit here typing, I was super excited to escape the freezing arctic cold front that took place in Philadelphia while I was on my trip. Negative 3 degrees…no thank you. Our day started with a short drive to Sedona. We took the scenic route and even though it added 45 minutes to our drive time, it was truly worth it. From the picture-perfect ranches, rustic red/orange colorful canyons, Indian markets, pine trees and rolling hills made the drive one you don’t want to miss. As you drive, taking in the indescribably spectacular views, it almost seems like the vivid environment surrounding you were fake. As I stared out the window I wondered how something so beautiful was formed. I tried to capture the true colors of the canyons in my photos but those failed to do it justice. 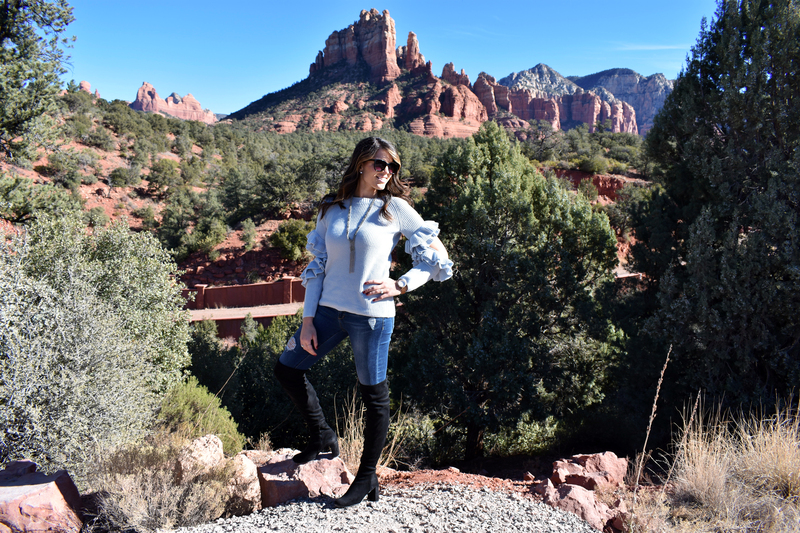 Trust me, add Sedona on your list to visit. When deciding on an outfit, I wasn’t quite sure if it was going to be cold or warm. Northern Arizona winters are unlike those in Philadelphia. For example, the local weather station informed me it was going to be chilly; however, I quickly realized anything under 55 degrees is super cold to the locals in Flagstaff. I decided to wear one of my favorite ruffle sweaters with an adorable peak-a-poo cutout elbow detail by BP. You had me at ruffle! This sweater is perfect for those in-between weather temperature days and is super chic. I received so many compliments and let me tell you, it’s so cozy and comfortable. The sweater runs true to size and comes in three other colors. I accessorized my outfit with my Treasure & Bond Long Y-Necklace and it paired perfectly! The necklace comes in two different finishes and has metallic stones interwoven in the chain. It can be worn with many different sweaters and blouses. I highly recommend this necklace. I paired the sweater with my go-to Article of Society jeans (if you haven’t purchased these jeans, I highly recommend you get them). The jeans run big so be sure to go down a size. My Chinese Laundry over the knee boots was great to walk around in and comfortable for all-day wear. I finished the look with my Michael Kors watch, David Yurman ring, diamond studs and my Rebecca Minkoff crossbody bag (perfect for traveling). These key pieces are very versatile and are key wardrobe staples. What are your key wardrobe staples? Also, if you have been to Sedona, tell me your favorite places and things to see while you were there. Look out for my travel guide in a future post.